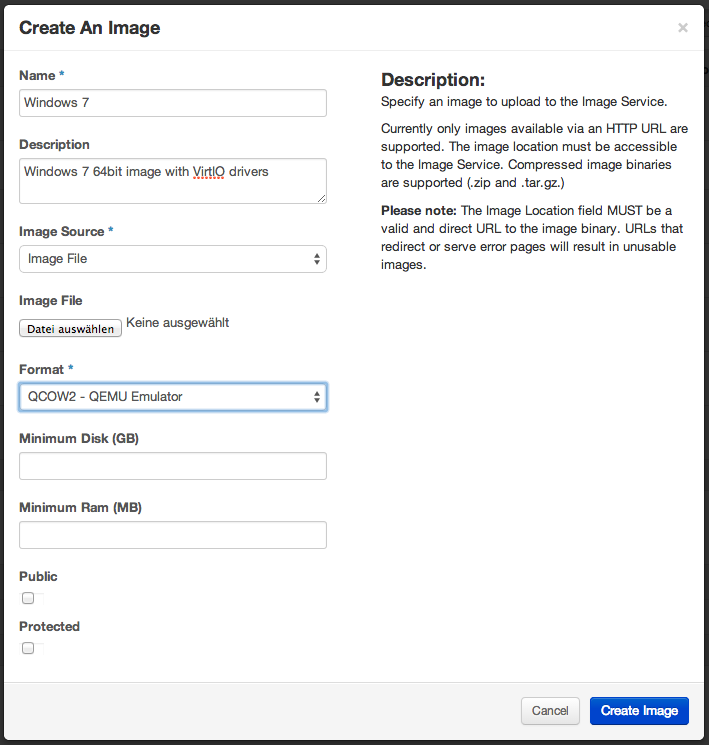 In this article I will show how to install a Windows 7 64-Bit image on OpenStack. For different versions of Windows watch out for the corresponding notes in the article. If you are working on a Windows or Mac machine you can not use a Linux-VM to do the installation. The VM will not be able to use the hardware virtualization extension (Intel VT or AMD-V). To store the iso files we create a directory called “iso” in the home directory. That step is not mandatory, but will help you to use the following commands. First you need an iso-file of Windows. Download a Windows ISO-File from your preferred site; e.g. a link for Windows 7 Professional can be found on the community website of microsoft ). Move the iso file in the “iso” directory. As for all Microsoft products you need to buy a license key to use the operating system, even if it is used as a VM. The tricky part to create a Windows image for OpenStack is to use the proper driver for the virtualized hardware components like the IDE controller and the network interface. Download the latest digital signed VirtIO drivers from Fedora and move it to the iso directory. Now after doing all preparation steps we can create the image. 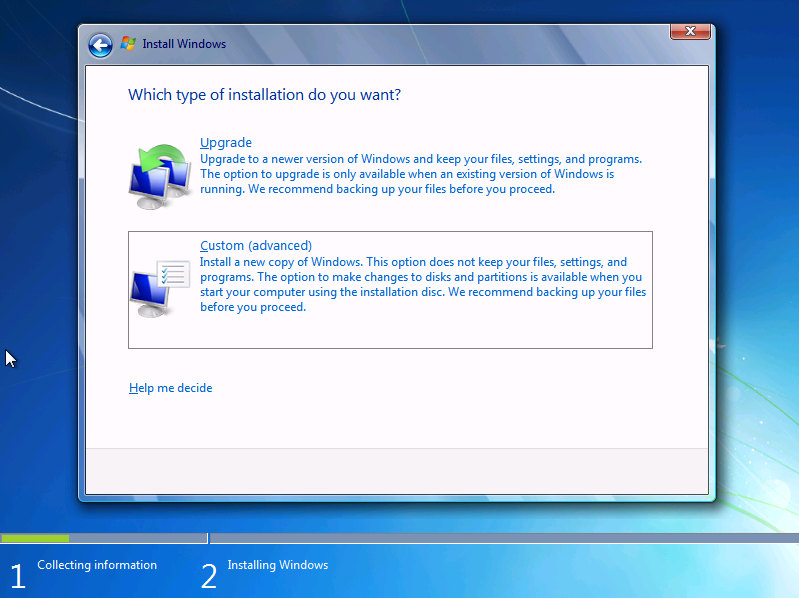 This image file will hold the Windows installation. Like before you could create a directory called “image” on your home directory to store the image file. Use the following QEMU command to create the image file. That command will create a image with qcow2 as format, win7_sp1_x64_en_vlk.qcow2 as a name and with a capacity of 100GB. At the moment that is only a container for the installation. The next step is to launch a VM with KVM and start the Windows installation. -usbdevice tablet: Use an USB tablet instead of the default PS/2 mouse. Recommend, because the tablet sends the mouse cursor’s position to match the host mouse cursor. Use a VNC-Client to connect to your new VM (on Ubuntu you can use Remmina, which is part of the distribution). The server is reachable on the server address: localhost:5909. The first one is while choosing the type of installation. 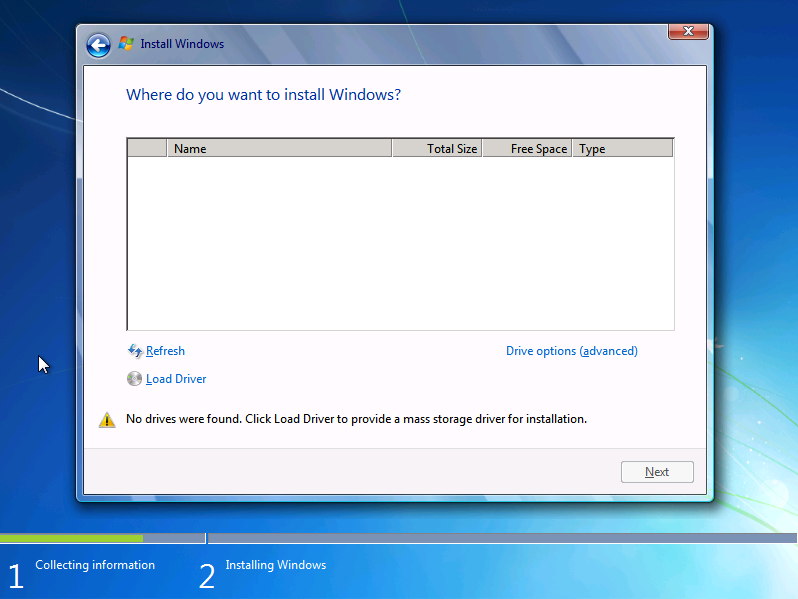 You need to do a custom installation, which allows you to install the VirtIO drivers. Navigate to the CD Drive with the VirtIO drivers . 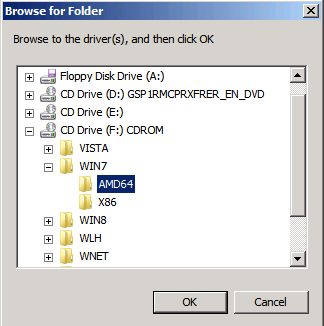 For the Windows 7 64bit version you need to select the “WIN7” -> “AMD64” directory. Click “OK”. Select the listed drivers (one for the Ethernet Adapter and one for the Hard Disk Controller). Click “Next”. Now you should be able to select the prepared image file as the disk for the installation. The second step of the installation where you need to be careful is when you have to insert the Windows product key. This step is not crucial. You do not have to insert the product key right now. 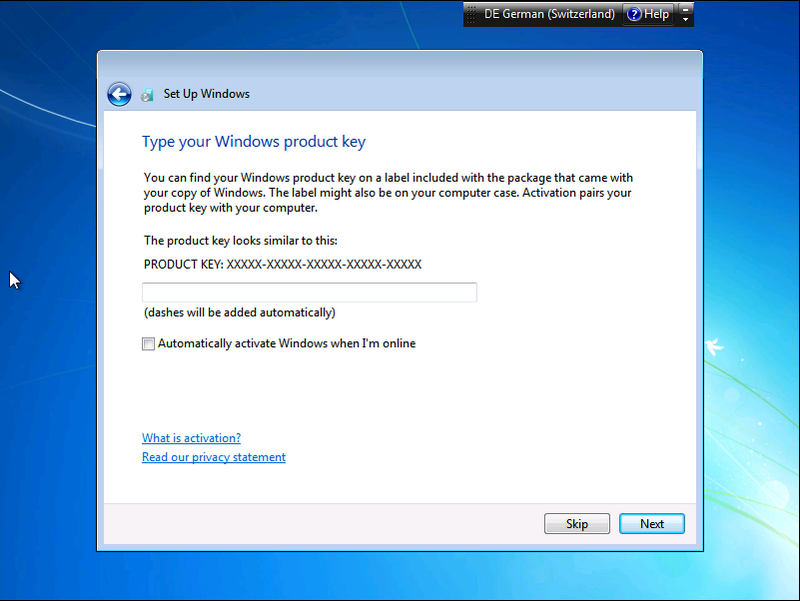 Windows will run for 30 days without product key. So it could be handy to insert the product key and activate Windows when the installation is completely done and Windows is running on OpenStack without troubles. Finish the installation, but do not install the updates right away. You will do that on OpenStack. The underlying image file that you created further up with the shell command qemu-img create, such as ~/image/win7_sp1_x64_en_vlk.qcow2 is now ready for uploading to the OpenStack Image Service. At that point the image should be about 8GB big for Windows 7. That image can now be uploaded to OpenStack. There are mainly 2 ways to do that; either by the OpenStack Dashboard or the CLI-client. The size of Windows images can grow rapidly. After an update you might end with a size of 17GB. We had problems to upload big images, so try out both upload method. To upload the image you can login to the dashboard, switch to “Images & Snapshots” and click on the “+ create Image” button. The image can be uploaded from a valid HTTP URL or from the local disk. The format needs to be QCOW2. On the dashboard you need to go to the image section. There you can create an instance from your new Windows image. Choose the flavor which fits the disk size of the image. In our case the disk size of the image was set to 100GB so we choose the flavor with 160GB total disk. The first build of the VM can take a while. Click on the Windows instance and than on “Console”. This will open a connection through the embedded VNC client of the browser. If all went right the Windows welcome screen should show up. 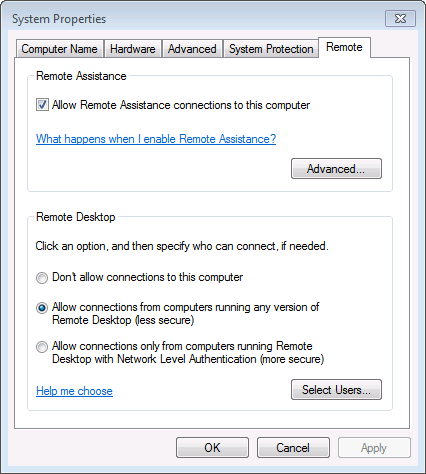 To be able to use the RDP to open a connection to Windows you need to enable the access in the Windows settings. 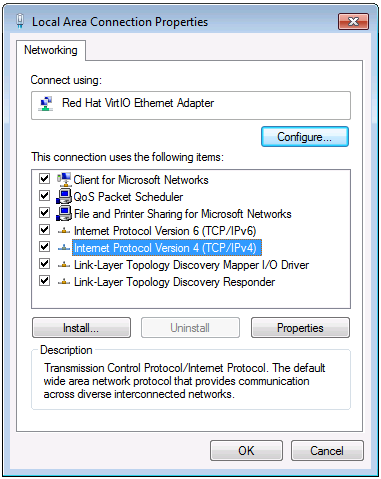 From a RDP client you can than connect to the VM by using its allocated floating IP address. The standard port for RDP is 3389. 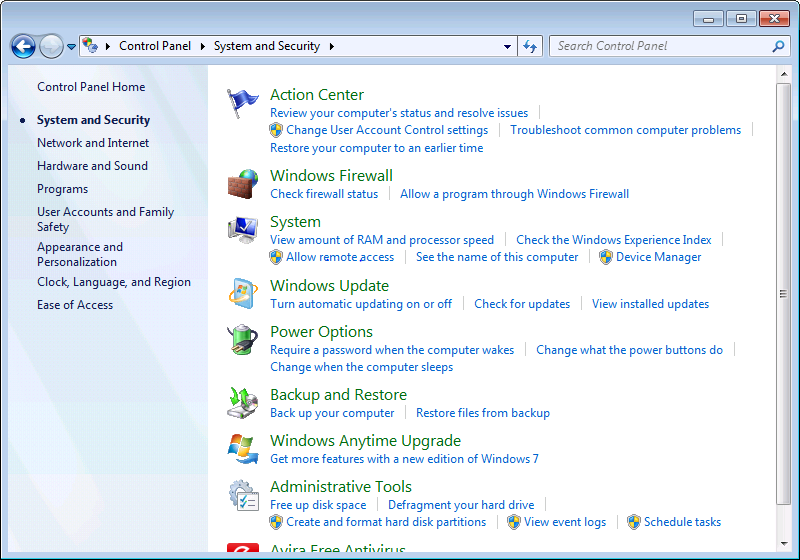 Open the “Control Panel” and chose “Allow remote access” from “System”. This will do the necessary firewall settings. 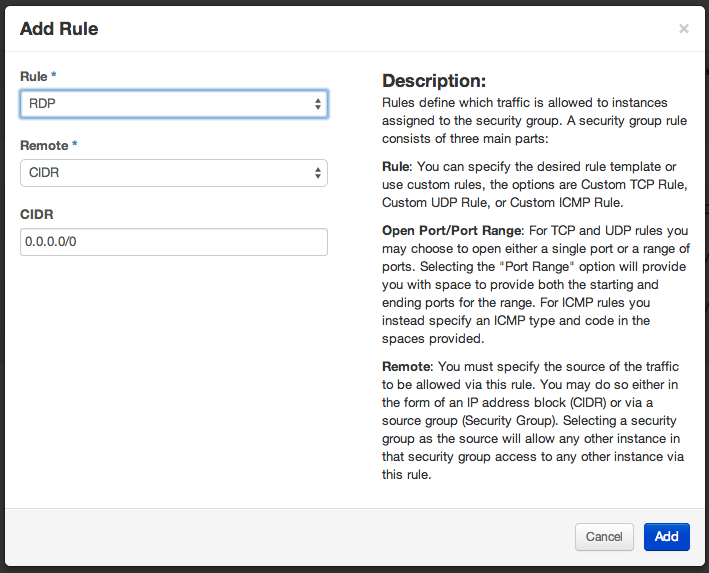 You also might need to set a new rule in the security group of OpenStack to allow a connection with RDP. If the connection is lost after a few seconds the problem is probably DHCP. 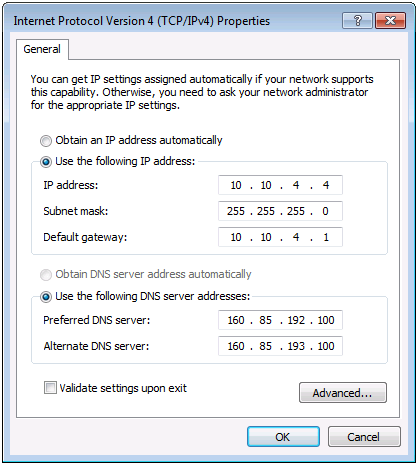 Deactivate DHCP in the Windows settings and use the IP address (e.g. 10.10.x.x.) you got from DHCP as a fix address instead. Do not use the floating IP address. 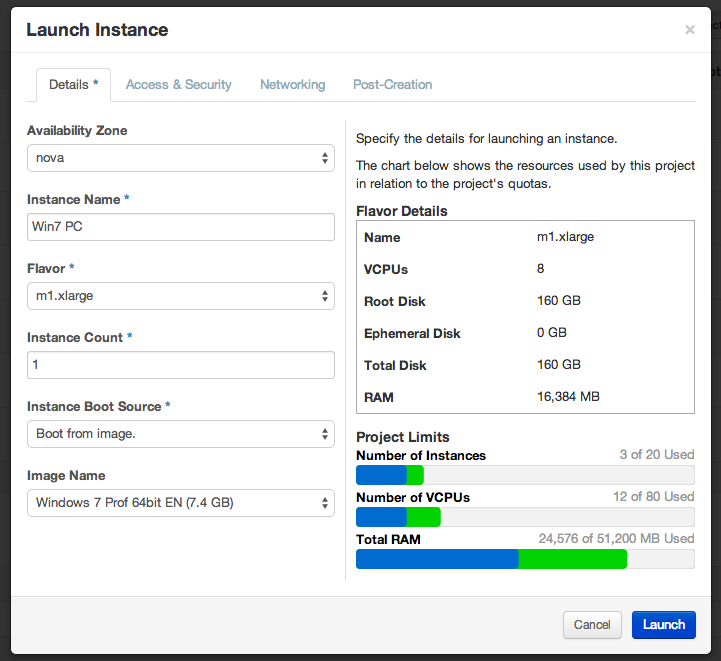 The IP address can be taken from the OpenStack dashboard under “Instances”. In Windows you have to open “Network and Sharing Center” -> “Change adapter settings” -> right click on your network connection -> Properties. Double click on “Internet Protocol Version 4 (TCP/IPv4)”. Click on “Use the following IP address”. Then set the “IP address”, the “Subnet mask” and the “Default gateway”. 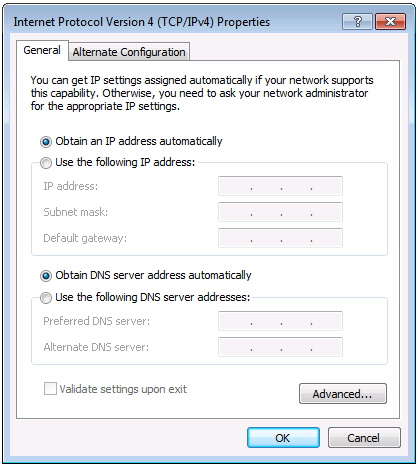 It is also necessary to set the DNS addresses. By following this guide you should now have a Instance of Windows running on OpenStack. Enjoy your new image! This entry was posted in *. * by musy. Bookmark the permalink. Thank you for your feedback! I corrected the tutorial. Have you worked with Windows 10? I’ve run into trouble. Unfortunately we didn’t build a Windows 10 image until now. I would try the Win8 virtio drivers for Windows 10. Hi, thanks for the guide. I can successfully create the windows7 QCOW2 file with size about 8G. However, I can’t launch the image on OpenStack. I tried those two ways to upload, it just said”failed to launch”. I noticed that the image still has 8G, did’t grow after uploading. Does this make an influence? Estimado tengo una duda, yo logre instalar el devstack correctamente con su red lan correctamente, logre generar el qcow2 de windows7 y logre lanzar la instancia con su respectiva ip generada del pool de ip el cual te lo da openstack, tambien tiene sus reglas respectivas en open stack. I only get an OK button with this error, and when I press that the loaded driver disappears from the list (like it was never loaded). No matter how many times I do that, it’s always the same notice/warning. The result is that I can’t load the VirtIO drivers in order to proceed with the installation. Any advice on how I can overcome this issue? Try another Windows 7 iso maybe?